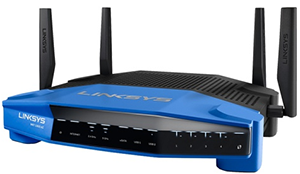 What is the Linksys WRT1900AC? The Linksys WRT1900AC is a simultaneous dual-band 4x4 Gigabit router with two (2) USB ports (1 x USB 2.0/eSATA combo port and 1 x USB 3.0 port). It supports a maximum of 600 Mbps on the 2.4 GHz band and up to 1.3 Gbps on the 5 GHz band. This router also comes with four (4) hi-performance external antennas for enhanced dual-band communication, maximum signal strength, better coverage, and range. The Linksys WRT1900AC can accommodate all your wired and wireless connections and is ideal for media-centric applications such as streaming video, gaming, and Voice over Internet Phone (VoIP). The 2.4 GHz Network caters to devices in your network that are 802.11b, 802.11g and 802.11n. QUICK TIP: The maximum speed that your devices can achieve with an 802.11n adapter on the 2.4 GHz band is up to 600 Mbps. The 5 GHz Network will only be able to cater to devices in your network that are 802.11a, 802.11n and 802.11ac. The Mixed mode will still allow backward compatibility for 802.11a devices. Two (2) Guest networks both for 2.4 GHz and 5 GHz respectively. These additional wireless networks allow your visitors at home to access the Internet but not your local network (i.e., shared storage devices, printer access). For your connected home, you may use the 2.4 GHz network to connect your wireless devices to surf the Internet and email, share files and print. The 5 GHz network is best for heavy applications including Voice over IP (VoIP) calls, online gaming, and streaming high-definition videos. To know more about the connected home, click here. The Linksys WRT1900AC has built-in USB 3.0 and Combo USB 2.0/eSATA (External Serial Advanced Technology Attachment) ports that can easily add Gigabytes of storage space to your network by connecting an eSATA drive or USB flash disk. The dual USB ports also allow you to set up two (2) USB printers at most on your network. On the combo port, you can only connect either a USB drive or eSATA drive at a time. You can easily set up and manage your router, device, and wireless network with Linksys Smart Wi-Fi. Alternatively, you may opt out of a Linksys Smart Wi-Fi Account but may still be able to configure the advanced settings on your router via the Local Access link. To know more about this feature, click here. 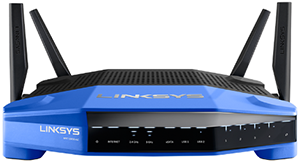 The Linksys WRT1900AC is powered by a Dual Core 1.2 GHz CPU processor for unparalleled speed. It is also developed to be Open Source ready. The Linksys WRT1900AC is DLNA® CERTIFIED for home media management. It is also wall-mountable to ensure flexibility. For instructions on how to wall-mount your router, click here. Setting up the Linksys WRT1900AC is made fast and easy because of its CD-less setup. Now you can run the setup from a web browser. To know more about this, click here. 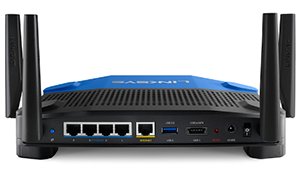 NOTE: Visit the Linksys WRT1900AC Product Page to read more troubleshooting articles, downloadable user guides or firmware updates and other support information related to this product. Power White Solid white The power LED is solid white while the router is powered ON. Blinking white It will blink when the router goes through its self-diagnostic mode during boot-up. Internet White/Amber Solid white The Internet LED is solid white when connected to the Internet. Blinking white It blinks white while the router works to establish a connection. Solid amber A solid amber LED indicates the connection is down due to configuration issues. Blinking amber Amber blinking indicates that the connection is down due to hardware issues. 2.4 GHz White Solid white The wireless LED is solid white when one (1) or more clients are connected to the 2.4 GHz network. Blinking white If the LED is blinking white, the router is sending or receiving data over the 2.4 GHz network. 5 GHz White Solid white The wireless LED is solid white when one (1) or more clients are connected to the 5 GHz network. Blinking white If the LED is blinking white, the router is sending or receiving data over the 5 GHz network. eSATA White OFF The USB/eSATA LED is OFF if no eSATA device is connected or a USB device is connected instead. Solid white The LED is solid white when an eSATA device is connected. Blinking white A blinking white LED indicates activity through the eSATA port. USB 1 White OFF The USB 1 LED is OFF if no USB is connected or an eSATA device is connected instead. Solid white The LED is solid white when a USB device is connected. Blinking white A blinking white LED indicates activity on the port. USB 2 Primary White OFF The USB 2 Primary LED is OFF if no USB 3.0 is connected. Blinking white A blinking white indicates activity on the port. USB 2 Secondary White OFF The USB 2 Secondary LED is OFF when a USB 1.0 or USB 2.0 device is connected. Solid white A solid white LED indicates a USB 3.0 device is connected. ETHERNET 1 thru 4 Primary White Solid white These numbered LEDs correspond with the numbered ports on the router’s back panel. If the white LED is solid, the router is connected to a device through that port. Flashing white A flashing white LED indicates network activity over that port. ETHERNET 1 thru 4 Secondary White OFF If the white LED is OFF, the router is successfully connected to a device through that port at 10/100 Mbps. Solid white A solid white LED indicates that the router is successfully connected to a device at 1000 Mbps. Wi-Fi Protected Setup™ (WPS) White/Amber The Wi-Fi Protected Setup™ LED blinks slowly for two (2) minutes during Wi-Fi Protected Setup™ (WPS). It will be solid white for five (5) seconds to indicate a successful connection. The LED blinks amber if the WPS process fails. Make sure the client device supports WPS. Wait until the LED is off, and then try again. The router supports one (1) session at a time. This router ships with four (4) adjustable external antennas that should be connected to the router before powering it on. To connect the antennas, twist the antenna connector clockwise onto the antenna port on the router. NOTE: The antennas are adjustable to customize your wireless signal for single or multi-story buildings and are removable to accommodate upgrades. This is the antenna positioning that is recommended for a single-story home. NOTE: You can also upgrade your WRT1900AC’s external antennas for enhanced wireless range and coverage in your single-story home by installing the WRT High Gain Antennas, WRT004ANT. To learn more about it, click here. This is the antenna positioning that is recommended for a multi-story home. Press this to easily configure wireless security on WPS-enabled network devices. Use Ethernet cables to connect wired devices to these blue Gigabit (10/100/1000) ports. Use an Ethernet cable to connect a broadband Internet cable/DSL or fiber modem to this yellow Gigabit (10/100/1000) port. Connect and share a USB drive or printer on your network or on the Internet. Connect and share a USB or eSATA drive on your network or on the Internet. You can also connect a USB printer, but only one (1) device to the port, and share it across your network. Press and hold this button for 10 seconds (until the power LED starts flashing) to reset the router to factory settings. You can also restore the factory settings using Linksys Smart Wi-Fi on the Internet or mobile app. Connect the included AC power adapter. Press to switch the router ON or OFF.